The largest deployment of an Army National Guard armored brigade combat team recently concluded and an even bigger Guard armor deployment is coming soon as the Army leans on the reserve side of its units and makes “total force” a reality. More than 3,500 soldiers with the 155th ABCT, which included elements of both the Mississippi and Kansas National Guard, deployed in support of Operation Spartan Shield in U.S. Central Command from July 2018 to March 2019. The nine-month deployment marked the first time in nearly a decade that a reserve component brigade of its size was deployed. 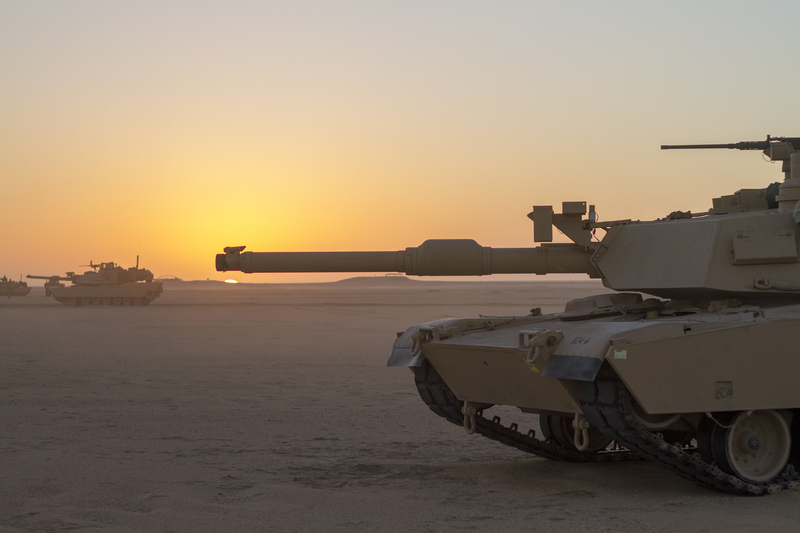 Col. Jack Vantress, commander of the 177th ABCT, First Army Division East, told Army Times that the direct action focus to train the 155th ABCT was the first of its kind in many years. The unit spent 45 continuous days in the field at Fort Bliss, Texas in preparation for the rotation. “You usually don’t see that many days continuous in the field,” Vantress said. “BCTs in the active component go a few weeks at a time, return, refit, then go back out for the next iteration,” he said. The job of the 177th was to observe, coach and train the 155th so that they could in turn do the same with their allied and partner forces in the region. Lt. Col. Christopher Jurney served as the operations officer for the 155th ABCT during the deployment. He has since taken command of the 1st Squadron, 98th Cavalry Regiment with the Mississippi National Guard. Jurney said that on some days members of the 155th were spread out over 22 nations across CENTCOM. “It was the full spectrum of operations,” he said. Some soldiers remained in Kuwait with headquarters elements and conducted training with partner forces there. Others were actively involved in Operation Inherent Resolve in Iraq and Syria as the campaign to defeat ISIS concluded. Jurney shared an example, saying one night he was in a five-star hotel in Kuwait for meetings with emirs and high-ranking military officers and officials, a few days later he’s sleeping in bombed out buildings in Syria as soldiers from the 155th are assisting in counter-ISIS operations. Lt. Col. Carlin Williams commanded 2nd Battalion, 137th Infantry Regiment with the Kansas National Guard for the deployment. Williams had done prior deployments on the active duty side with the 82nd Airborne Division and with the Guard. “The preparation for this deployment was completely different,” he said. Soldiers under his command did training exercises with United Arab Emirates armored company soldiers, both direction action and live fires. Another battalion participated in Operation Bright Star in Egypt. They also partnered with the guard force of the Kuwaiti military for their part of the Spartan Shield mission. That mission has been running in various forms since at least 2012 and serves mainly as a strategic deterrence initiative for partners in CENTCOM. Jurney served on three Iraq deployments from 2005 until now. He said the ABCT deployment is the most challenging. “The great thing about an ABCT is if you can handle logistics for an ABCT, you can do just about anything in the military,” he said. The 155th has now returned and demobilized as of this month. Army Reserve soldiers with the 210th Regional Support Group out of Puerto Rico handled the mobilization of the 155th. During that same timeframe the 210th RSG dealt with deploying Guard troops to the U.S.-Mexico border. The next armored brigade Guard unit slated for mobilization is the 30th ABCT with the North Carolina Army National Guard. That will be larger, with a planned 4,200 soldiers taking part in the rotation. The 653rd RSG out of Arizona will be the unit to handle mobilizing that rotation, according to an Army release.